Drawing of a monument to King Osrick (also known as Prince Osric) in Gloucester Cathedral Church, which is located very near the High Altar. Prince Osric, who died in 729, was the founder of the 7th century Saxon Minister here. This monument to him was erected by Abbot Malvern in c.1530. Osric holds the abbey church in his left hand and a sceptre in his right hand. 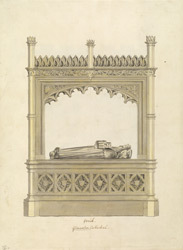 The effigy lies on a tomb chest with a heavy Tudor canopy in the Gothic Perpendicular style.